Who knows what people will do in the dark. After several days of lights flicking off and on this summer, I was somehow reminded of the cigar boxes long stored on the laundry room shelf. I’d collected these boxes at least a decade ago with the fantasy that I would some day fill them with intriguing ephemera in the tradition of my inspiration, artist Joseph Cornell (1903-1972). Within the confines of small, graceful chambers, Cornell created intimate environments that were magical, mythical, playful, sensual, scientific and searching. They were also beautiful. Cornell’s imagery drew on the celestial, the timeless and the fleeting – soap bubbles to butterfly wings. He was attracted to exotic birds, ballerinas and women both living and historical whose physical presence eluded him. He was influenced by Surrealism and Abstract Expressionism as well as by contemporary artists, the theater, opera and film. He was also an experimental filmmaker. Cornell haunted New York flea markets, thrift shops and bookstores, wherever he could find raw materials – old maps, constellation charts, prints, photographs, shells and marbles, bubble pipes and cork bobbers. He used collage and assemblage to transform such “found objects” into imaginative shadowboxes that are mysterious and deceptively simple in their elegant understatement. Apparently Cornell’s myriad collections gradually grew to clutter his mother’s house in Flushing, New York where he lived with her and his disabled brother until they both died. I know about clutter. I have, however, tucked my own mementoes, bits and pieces of minutiae into paper bags on another laundry room shelf. On a recent power-outage day, I finally had a look. There were the vintage photos and postcards, mirrors, broken glass, movie and theater stubs, feathers, shells and even a cup of saved sand. I dusted off the cigar boxes and started playing. A childhood picture glued in place, a mini telephone; a pocket mirror reflected crashing waves on a hand-colored postcard. I added a magnifying glass to the loose sand and hoped that helped. I’m still playing, taking out a twig, putting in a torn plane ticket, unsticking my fingers from Crazy Glue. 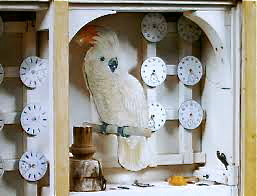 It could take awhile to become Joseph Cornell.